Exfoliation is important for vibrant, healthy skin. Many of us add natural exfoliants to our soap recipes, but sugar and salt scrubs have become another popular way to moisturize and exfoliate at the same time. In them, you combine an exfoliant (sugar or salt) with oil and other ingredients. The oil penetrates the skin while the salt/sugar exfoliates as you rub it in. The only downside? They're really messy, and sugar scrubs in jars require a preservative to prevent bacteria and mold growth. So here is a simple-to-make variation of the sugar scrub that uses melt and pour soap along with the sugar and oil to make an easy-to-use, single serve sugar scrub. The first thing to do is melt the melt and pour soap base. We like to divide this recipe into three parts. It makes the ingredients easier to mix together and it lets you choose different colors and fragrances to use. But if you have a big bowl and want to use just one fragrance and color just use the whole amounts in the recipe. For this first third of the recipe, melt 2 ounces of soap in a measuring cup. You can use either white or clear soap base. Clear soap base is going to allow deeper colors while white is going to make more pastel colors. Melt the soap in the microwave for 30 to 40 seconds. To the melted soap, add 2 ounces of the light oil. (Remember, this is just 1/3 of the whole batch.) Stir well. These scrubs are just fine white and you may prefer a more natural look to them. But if you want some color, add in a few drops of liquid colorant, or, as we're doing here, about 1/4 tsp. of mica. Stir the mixture well. Add the sugar and begin to stir. The soap is likely going to harden quickly, so you're probably going to need to put it back into the microwave for 10 to 15 seconds. Just enough to get it smooth and stir-able again, but not hot enough to start melting/dissolving the sugar. When the mixture is re-heated, stir well. Spoon the mixture into the mold of your choice. Here we're using small mini muffin tins. Each of these scrubs ended up being about one ounce. This is a great time to break out those cute silicone molds but ice cube trays work just fine as well. It's all about what look you prefer. Set the scrubs aside to cool in a safe, clean place. When the scrubs are completely cooled, they'll feel like soft bars of soap. Easy enough to handle, but soft enough to mold/squish/dent. Put them into a jar or plastic container and when you want to exfoliate and moisturize, take one out. Use it with warm water and rub it on your skin like you would a bar of soap. 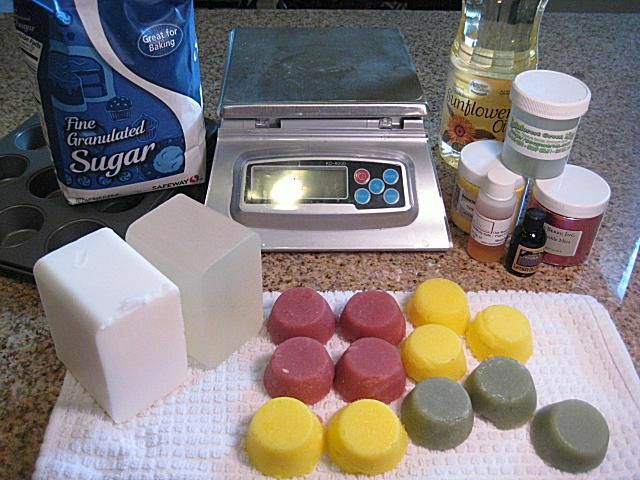 The soap, oil, and sugar will start to dissolve and coat your skin. Rub the sugar into your skin to exfoliate gently, and rinse! The great thing about these scrubs is how portable and easy to use they are. The other great thing is that the soap ends up making the oil really easy to rinse off and clean up. No oily mess!